The former jockey's exercise regimen includes three to five days working out in a gym near his San Jose, Calif., home and pushing his wheelchair 10 miles nearly every other day. He estimates his training includes some 5,000 miles. Rivera has competed in races in San Francisco, El Paso and Las Vegas. His sponsors include his hometown's Liberty Roofing Company and Moneysport.com, whose owner Brian Maher will be in Lexington to videotape his race. 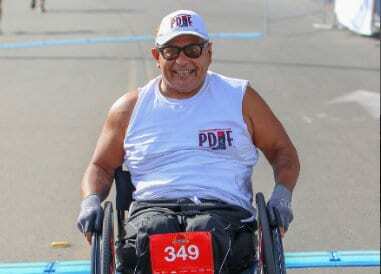 Rivera's racing attire includes a shirt or cap with a Permanently Disabled Jockeys Fund logo. He often uses the monthly stipend he receives from the PDJF to pay his racing entrance fees. Rivera was one of the six catastrophically-injured jockeys honored at last summer's Jockeys and Jeans Event at Canterbury Park and will attend the group's PDJF fundraiser at Santa Anita on June 22. The group, founded by a group of former jockeys in late 2014, has raised over $1 million dollars for the PDJF. This entry was posted in NL List, People and tagged Armando Rivera, barry pearl, Bill Thomason, gary birzer, jockey, jockey fall, Jockeys and Jeans, Keeneland, paraplegic, pdjf, permanently disabled jockeys fund, wheelchair by Edited Press Release. Bookmark the permalink.